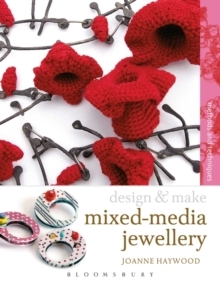 Design and Make Mixed Media Jewellery provides a thorough and comprehensive introduction to a wide range of materials and techniques that you need to get started in this exciting area of jewellery making. This book will help jewellers of all levels learn and adapt a wide range of techniques and skills to various types of materials through a series of making sequences, and learn how to incorporate these within their own designs. Materials covered include silver, paper, metal leaf, polypropylene, cover buttons, beads, tin cans, found objects, printed images, willows, yarns, felt, fishing latex elastic, wood and polymer clay. The making sequence includes twelve projects using mixed media methods. Gallery pages showcase leading makers around the world and contextualise the projects, linking each one to a gallery of contemporary makers work.